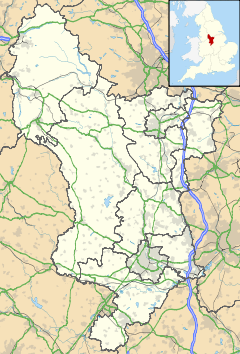 Etwall (SK 268 316) is a village and civil parish in Derbyshire, England, southwest of Derby on the A50. The population at the 2011 Census was 2,906. Etwall is located between the A516, which bypassed the village in February 1992, and the A50 in south Derbyshire. The A516 draws a lot of heavy traffic heading for the M1 north. The village has its own public library, several schools including a state pre-school, state primary, an independent day school and the large secondary school, John Port School. The parish church is St Helen's. A war memorial is located in the shadow of a memorial tree which was planted in the 1800s. There is also a Buddhist centre at Ashe Hall established by Kelsang Gyatso. Some of the inhabitants work at the Toyota car factory which is located east of the village. The part of the village that is closely adjacent to the A50, and the Toyota Car factory, is separately named as Etwall Common. The village name comes from Etewelle, meaning "Eatta’s water", Eatta being a 7th-century Saxon leader. Etwall is famous for its well dressing festival every May. The John Port Grammar School opened in 1956, with the Etwall Secondary School on the same site. They combined as the comprehensive John Port School in 1965. Etwall is an affluent and vibrant village benefiting from several amenities including a post office, library, two village stores, a restaurant, pharmacy, dental practice, veterinarian, large village hall, leisure centre and cricket club. Etwall also plays host to a swimming club tennis club and the Team FS Derby, a Futsal Club of the FA National Futsal League. The village has two historic pubs on its Main Street: the Spread Eagle (opposite John Port School) is the oldest and the Hawk and Buckle dates from around 1800. There is also the more modern Seven Wells on Heage Lane and a Bar inside Blenhiem House. The King George playing fields hosts the local football team Kings Head FC (sponsored by the Kings Head of Hilton) on Sunday mornings.The village is also served by a modern community centre/village hall named after the popular former primary school caretaker and good samaritan "Frank Wickham" which hosts community events and also is used as a polling station at times of local and general elections. The village has excellent walking and cycling links with three national cycle network routes meeting in the village; Route 54, Route 549 and Route 68. During the period of 2015 - 2017 and beyond Etwall is due to have new building work on former "John Port" trust land which was left in trust and rented to local farmers. This marks the biggest expansion of Etwall village since the post war building in the 1950s and 1960s by Wimpey builders, and is due to expand the village's housing stock and increase local amenities. 18.4% of South Derbyshire's Band E to H properties are located in Etwall, with 12 out of 81 of the council's band H properties located in the village. ^ "Civil Parish population 2011". Neighbourhood Statistics. Office for National Statistics. Retrieved 24 March 2016. ^ "Etwall Pre-School". Retrieved 12 August 2013. ^ "Etwall Primary School". Retrieved 12 August 2013. ^ "Kadampa Independent Primary School". Retrieved 18 January 2014. ^ "Tara Kadampa Meditation Centre". Retrieved 12 August 2013. ^ "Etwall Well Dressing Association". Retrieved 12 August 2013. ^ "Etwall Conservation Area Character statement" (PDF). Retrieved 12 August 2013. ^ "Etwall Post Office". Retrieved 21 January 2016. ^ "Etwall Library". Retrieved 12 August 2013. ^ "Etwall Village Store". Archived from the original on 1 February 2014. Retrieved 19 January 2014. ^ "Blenheim House Restaurant". Retrieved 19 January 2014. ^ "Etwall pharmacy". Archived from the original on 11 February 2014. Retrieved 19 January 2014. ^ "Etwall Dental Practice,". Retrieved 19 January 2014. ^ "Sarah Smith Veterinary Cardiorespiratory Specialist". Retrieved 19 January 2014. ^ "Frank Wickham Hall". Retrieved 19 January 2014. ^ "Etwall Leisure Centre". Retrieved 12 August 2013. ^ "Etwall Cricket Club". Retrieved 18 January 2014. ^ "Etwall Eagles Swimming Club". Retrieved 12 August 2013. ^ "Etwall Tennis Club". Retrieved 18 January 2014. ^ "The Hawk and Buckle Etwall". Archived from the original on 12 August 2013. Retrieved 12 August 2013. ^ "The Seven Wells Etwall". Retrieved 18 January 2014. ^ "Blenhiem House Bar Etwall". Retrieved 18 January 2014. ^ "National Cycle Network Route 54". Retrieved 18 January 2014. ^ "National Cycle Network Route 549". Retrieved 18 January 2014. ^ "National Cycle Network Route 68". Retrieved 18 January 2014. ^ "Neighbourhood Statistics - council tax". Retrieved 14 February 2017. Wikimedia Commons has media related to Etwall. This page was last edited on 8 November 2018, at 12:23 (UTC).